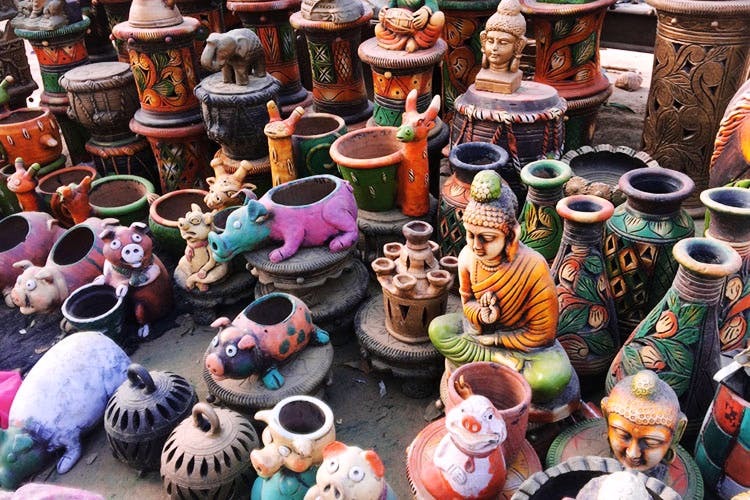 Ceramic pots, frames, restored wooden furniture and kitchenware – the road connecting AIT Chowk to Tau Devi Lal Park in Gurgaon is lined with small, make-shift furniture shops that are a dream come true for bargain-hunters. A beautiful turquoise hand-painted dresser, a regal bookshelf or bright yellow chairs to go with your dining table – these are some of the things we spotted while walking down this road. Most of the wooden furniture sold here is reclaimed and restored – the ‘banjaara’ shop owners are happy to polish, repair or spruce them up before you pay. Full dining sets, bar counters or engraved boxes – if you’re looking to furnish on a budget, we’d definitely recommend braving the heat and striking a bargain at this market. Not to brag, but we were able to bring down the price of a massive bookshelf from INR 1,250 to INR 800 so the sky is the limit. The other big focus at this market is ceramic. Bowls, pop-coloured spoons, mugs, vases and animal-shaped planters – the ceramic craft at this market is decorated with quirky floral patterns. Perfect for your toothbrush, kitchen utensils or delicate pieces of jewellery, we think these would make interesting home-decor elements. We spotted the cutest polka-dotted tea light holders and long, exquisite candle stands that just need some quick fixing to look brand new again. Minimalist white photo frames, or silver ones that are exquistely carved – these are worthy of displaying your happiest memories. There’s such a large selection that we guarantee you’ll be browsing for a long, long time and the prices are low enough that you’ll probably take home quite a few. One-of-a-kind pieces, we absolutely loved the mirrors at this market too. Step away from the malls and head here for some unique home decor accessories that are guaranteed conversation-starters. The best bit? it doesn’t cost a bomb.